First, though, let's talk about this "13 Spooky Tales" line. They released several of these DVD sets with different themes about the same time, each collecting ostensibly similar episodes throughout the years. In this case, even the math to get to 13 episodes is dubious. In reality, there are 12, unless you count The Nutcracker Scoob, parts one and two as separate. Together, they're only a half-hour: it actually begs the question whether several of the 7-minute shorts should be counted as full episodes. Of course, one of these was a full hour, so they partly make up for including the shorts. Incidentally, if that hour-long had been 15 minutes, I'd have been a whole lot happier. 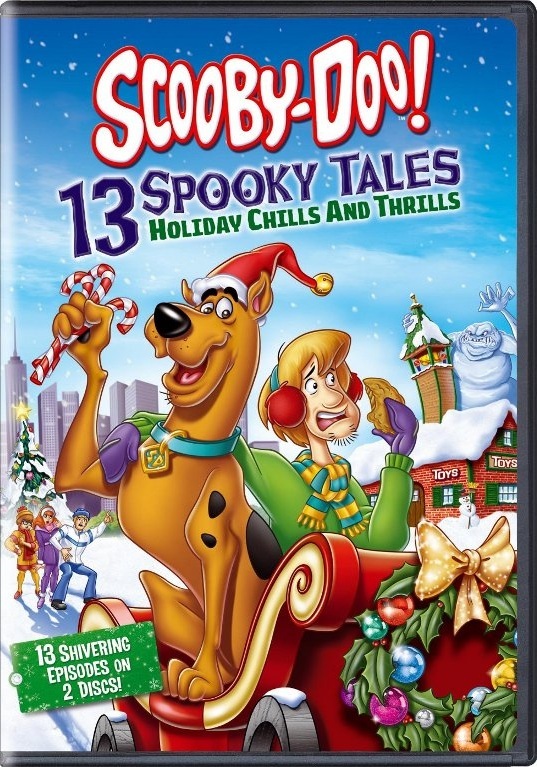 This spin-off features Scooby, Scrappy, and Shaggy without the other three members of the squad. The trio appear to have their own detective agency, though the "case" they're working is more a chauffeur job: they're supposed to deliver a spoiled boy to a house through the snow. If he's not there by midnight, he loses his inheritance, which of course means a relative in an abominable snowman suit is trying to keep him away. After a brief "boy who cried wolf" set-up, the episode devolves into the usual chase sequence, followed by a standard unveiling. The kid gets his money, despite the fact he seems to be a horrible person (not even the heroes like him). Aside from the winter aesthetic, there's not much in the way of Christmas here: no mention of dates or presents or anything. It's not at all funny or exciting, though I suppose the writers deserve some credit for letting a spoiled brat win. Life, after all, is not fair: if it were, we wouldn't have sat through this crap. To its credit, it was only seven minutes long. Why the hell is this even on here? Every other episode at least has some tenuous connection to Christmas, even if it's nothing more than there being snow present. This one is about Scooby, Scrappy, and Shaggy trying to earn camping merit patches and running into Bigfoot. No snow, no Santa, no decorations: nothing remotely Christmas to be found. The short is only seven minutes long, not that the time flies by. This was clearly made in the era when the producers wanted to appeal to younger viewers who enjoyed laughing at the funny dogs, since everything else - including any hint of mystery - is out the window. Early on, the trio get launched deep into the woods after their boat accidentally inflates, gets punctured on a rock, then carries them miles away. Scooby almost immediately runs into Bigfoot, though Scrappy doesn't believe him. Making matters no more entertaining, Scooby winds up covered in poison ivy. In an effort to cure him, Scrappy wraps his uncle in bandages then takes off with Shaggy for firewood or something. While waiting for them to return, Scooby sees Bigfoot enter their camp and eat all their food. The others return, and Shaggy accuses Scooby of eating the food and making up the story about Bigfoot, who promptly emerges, rendering all dramatic irony moot. Queue chase sequence down a river, which finally dumps the main characters back at Camp Kickapoo. Yup. Comedy gold. Bigfoot, meanwhile, wanders off. Presumably, it was actually the monster, not someone in a suit. Take that, skeptical rationale that defined the premise of earlier incarnations of the show. Because I know you all care deeply, they failed to earn their camping patches but made up for that with a number of others. The animation and writing were both weak: overall, this about as good an episode as it was relevant to the holidays. This episode is set entirely at the North Pole, which is also the extent of its holiday connection. The gang was sent for by a scientist who gets abducted by a gigantic white dinosaur before they arrive at the Eskimo village he was staying in. My racism sense is tingling. The portrayal of the Inuit tribe, while certainly not good, was actually slightly less offensive than I'd expected. At least the portrayal of the one member of the tribe who hadn't been run off was. He was a stereotype, but he wasn't used as comic relief, nor was he the villain. So... kudos for meeting the absolute minimum requirement for 1970's entertainment. Of course, they still portrayed the Inuit as living in tiny igloos right at the North Pole. Oh, and the episode progressed from night to day in what seemed like a 12 hour period (a personal pet peeve of mine: the poles only experience one day a year). To the show's credit, chase scenes with a full-sized dinosaur are more interesting than those with a human-sized antagonist, so this wasn't as boring as it could have been. When it wasn't devolving into zany shenanigans, some sequences were almost suspenseful. The resolution, of course, was both obvious and idiotic. The scientist's assistant was the culprit, along with his partners at an oil company. They'd built the robot dinosaur to chase the tribe away and steal a pocket of oil under the ice. I suppose the writers should also get some credit for making an oil company the bad guy. Over all, it was more fun than most of these, despite some missteps. This was a bizarre thing to stumble across without context. The New Scooby-Doo Movies was a series of hour-long episodes featuring a guest star each week. Crossover episodes with Batman and Robin, the Harlem Globetrotters, and the Three Stooges all exist. Unfortunately, this vaguely Christmas episode featured Laurel and Hardy instead. Not the real Laurel and Hardy, mind you: these were the voice actors from the 1966 Laurel and Hardy animated series you've never heard of and/or don't remember. The plot is essentially the same as the plot to almost every episode of Scooby-Doo: someone's pretending to be a ghost or monster to scare people away while he tries to steal something. In this case, there's a twist: instead of pretending to be a ghost or a monster, the villain is pretending to be the ghost of a monster. The episode is set in and around a ski lodge, where Laurel and Hardy get work as bellhops. This doesn't really make sense, since the Mystery Inc. kids recognize them, implying they're also famous comedians. Whatever - it's not like anything else in this special made sense, either. The villain is an old man who is both using a projector to create an illusory ghost of bigfoot AND dressing in a costume and running amok through the ski lodge. Also, he had an assistant who looked and sounded like the ghost of bigfoot, but that guy just kind of disappeared without being mentioned again. If you're wondering about motive, he was stealing cars then disguising them. So... at least he wasn't looking for buried treasure. Laurel and Hardy were given a number of incredibly dull comedy sequences together, then split up to help the kids. None of it was fully developed, though the investigation was quite a bit more interesting than anything else. If they'd dropped Laurel and Hardy and cut this down to the old thirty minutes, it would have been much more tolerable. As it was, it dragged throughout. Once again, the episode was set in a wintry setting, providing at least a nominal holiday connection. There was also some discussion about Christmas, itself, early on, though Fred pointed out it wasn't time yet. Another episode, another winter-themed monster making trouble at a ski resort. Only this time, there's very little skiing: instead, there's a snowboarding competition going on. How positively x-treme. This is actually the first episode of the 2002 series, What's New, Scooby-Doo? That's... supposed to be a declarative statement. I hate punctuation in show titles. This incarnation of Scooby-Doo was clearly trying to modernize the concept (hence the snowboarding) while keeping the key voice actors and character traits. To its credit, it almost feels like a proto-Mystery Incorporated, the 2010 series that elevated the concept to truly impressive - and genuinely scary - levels. This wasn't quite there yet, but it toyed with giving the "normal" characters flaws. Fred, in particular, comes off as reckless and short-sighted, traits that the later incarnation would explore. In this one, he breaks his leg halfway through the episode. Velma, despite wearing a comically over-sized coat, catches a cold, leaving the others to solve the mystery. In one of the better sequences, Daphne investigates on her own and is portrayed as component and capable, for a change. Scooby and Shaggy, of course, are zany and ridiculous, which is really what's needed to stop the monster. Or, more accurately, the robot, which is being controlled remotely by one of the snowboarders trying to fix the competition by wounding his competitors. The main Christmas element was the monster itself, essentially an animated snowman gone bad. Shaggy, at least, noticed the parallels and made several Frosty jokes during the episode. It's certainly not great, but this one had decent production values, and a few of the gags worked. That said, the over-the-top snowboarder scenes dated it immediately. This episode features the puppy at his prime. In case there was any doubt, this is a very bad thing. All of his catch phases are here, and the character is essentially the star. The plot involves - stop me if you've heard this one - the Scooby Gang go to a ski lodge, only to discover it's almost empty, because a ghost is scaring the guests away. Their investigations lead to a series of absurd chase sequences, until they finally capture and unmask the "ghost", only to discover he's the descendant of the historical figure he's pretending to be and is searching for treasure his ancestor left behind. There are a few things setting this apart, though. First, there's Scrappy, so every damn chase includes scenes where he tries to attack the ghost, only to pulled away by Scooby. Also, there is what I can only describe as the worst animation I have ever seen in a Scooby-Doo show. Some of the shots of faces look as though they were done by a four-year old. I suppose the ghost's design is pretty decent, though it doesn't look all that distinct from numerous other monsters the gang's gone up against over the years. All things considered, this was a pretty awful episode: easily the worst we sat through on this DVD set. Okay. I think we've finally reached the original ski lodge/monster ghost episode most of the others are duplicating. This was the last episode of the first season of the incarnation of Scooby, which is - by most metrics - better than anything that would appear for at least a couple decades. The show is still repetitive and cheesy, but the monsters are usually cool, there's at least an attempt to build a little suspense, and the animation is decent. The plot and setting are essentially the same we've seen in several other episodes: there's a ski lodge with few visitors which is being terrorized by the ghost of a wintry monster. In this case, it's a yeti's ghost. The gang investigates and discovers a Tibetan temple where an old monk tells them the story of how he was once chased by a real yeti, which fell off a cliff and died. He thinks its spirit has returned to take vengeance. In reality, the hoax is being done by the lodge owner and another Asian character, who's even more stereotyped than the monk, but the gang won't piece that together until tracking the ghost to a saw mill, where they discover white powder and a hollow log full of gems. Also, the ghost, leading a series of implausible chase sequences and murder attempts. For all this episode's shortcomings, it was kind of nice seeing the villain actually attempt lethal force for a change: he tried sawing Velma in half and came close to killing Scooby and Shaggy with dynamite. That kind of commitment is common these days, but for most of the 70's and 80's, villains were content to rely on scares. Once again, the Christmas elements were limited to the winter wonderland: no mention of the holiday or any tropes. This episode is set in an abandoned town centered around a ski lodge. The town's power is out due to the attacks of what appears to be a ghost made out of electricity, the "Ten-thousand Watt Ghost." which sort of looks like a Doctor Seuss character. The plot, for once, is actually a bit complicated. The ghost is supposedly the spirit of an electrician, who disappeared during a blizzard. Since then, he's been scaring away townsfolk and sabotaging the power plant, allegedly to take vengeance on the plant owner and mayor, who sent him out on the assignment. Naturally, this leads to Scooby, Shaggy, and Velma interrogating a parrot using flashlights, which reveals the mastermind is the mayor, who's attempting a freeway-related land con. Got that? The sad part is, I'm really not skipping over all that much connective tissue. The gang finds sunflower seeds in the power plant, which brings them to the pet shop. Why, exactly, they're using the pet store as a front for a tunnel leading to the power plant is never explained. Presumably, one of the writers just wanted to work in that scene with the parrot. At any rate, the parrot eventually gives them some information after a painfully idiotic interrogation. Specifically, he points them towards the closet, where they find a rubber suit and the tunnel. The next clue they get is a note pointing them towards an area of land. They pull a book on the subject from the town archive and play keep-away with the ghost. Eventually, they trap him and short out his suit with a giant ball of snow. The supposedly dead electrician actually is the ghost: he was taking orders from the mayor, who was using the commotion to scare people out of town and buy their land cheap, all so he could sell it at a profit when a freeway came through. A tad complicated, but I suppose this better than another lost treasure. The monster is the real disappointment this time around: the thing looks more silly than scary. Still no Christmas in sight: just more snow. Even less Christmasy than most of the episodes in this set, this one isn't even set in winter. The only connection to the holidays is that it centers around toys, which is more inline with parodying the Toy Story movies than anything else. That said, this was by far the best episode in this collection. It's clever, entertaining, and fun; plus the plot actually has a decent twist. The premise is that the toys in a mall store are coming to life at night and wreaking havoc on the other stores. The gang volunteers to spend the night in the mall and get to the bottom of it. Besides them, there are four suspects: the toy store manager, a toy safety activist, the night watchman, and a nerdy toy collector/designer. Like in "There's No Creature Like Snow Creature" above, this one elevated Daphne to the team's action hero when needed, balancing her obsession with fashion with competence. Nice touch. Velma remains the team's mastermind, while Fred's shift towards comic relief is clearly in motion. He's really only a hair's breath away from the character he became in Mystery Incorporated. Also like Mystery Incorporated, this show had a lot of fun playing with its tropes. When Fred announces early on, "I have a plan: let's split up and look for clues," it's clearly intended to come out sounding as idiotic and reckless as it should. Even the zany chase sequences were fun this time. Structurally, they were similar to the ones Scooby-Doo has always had, but these were better handled. The pacing, animation, and writing pulled off the desired effect, and the result was solidly entertaining. The mystery has quite a few elements, from the reveal that the toy collector is also an inventor with a van full of high tech gear, the gang stumbling across a giant drill in the basement, the discovery that the toy safety expert had broken into the toy store to steal their batteries, and the realization the mall was built on the location of an old art museum, which had closed after being robbed (with the paintings never recovered). Oh, and also the discovery - about halfway through - that the toys were being controlled remotely using a universal receiver versatile enough to operate any toy. At the end of the episode, Velma assembled the suspects and revealed she'd put together a radio tracker that would lead them to the criminal. At the last minute, the toy collector admitted he'd been the one to invent the remotes, and that the whole thing had been done for publicity. It was a good thing he admitted, Velma explained, because the tracker was just a ruse. It was only driving away that she realized his confession was false: he just wanted credit for the invention. They returned to the mall to unmask the real culprit, who was using the commotion to recover the artwork he'd stolen and hidden in the art museum. It was obvious, of course, but I think this is the first time I've seen that kind of fake-out in any incarnation of Scooby-Doo. Of course, I've only seen a small fraction of what's out there. This episode was refreshingly funny and enjoyable. By far the strongest on the DVD set, even if it didn't have anything to do with the holidays.